14 April 2014. Engineers at Massachusetts Institute of Technology and the affiliated Lincoln Laboratory developed a process for adding minute particles into materials that can be encoded and sensed by inexpensive readers to detect counterfeit goods from the originals. The team from the lab of chemical engineering professor Patrick Doyle published its findings yesterday online in the journal Nature Materials (paid subscription required). The problem of counterfeiting ranges from knockoff fashion garments and electronic goods to currencies and phony medications with life-threatening implications. OECD estimates counterfeit goods account for 2 percent of all international trade, calculated at more than $250 billion in 2007. To combat counterfeiting, legitimate manufacturers and distributors use additional labels or electronic tags, yet these too can be counterfeited, or are unreliable and too expensive. 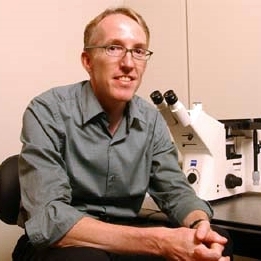 Doyle and colleagues in 2006 designed a system for making microscale particles — measured in increments of microns or one-millionth of a meter — that employs photolithography and microfluidics to imprint shapes into chemical components that make up more complex polymer materials like those found in many plastics. When exposed to ultraviolet light, the microfluidic stream of components reacts and forms into polymer particles. The researchers today adapted that process to create new particles about 200 microns long imprinted with nanocrystals — measured in billionths of a meter — containing traces of rare earth elements ytterbium, gadolinium, erbium, and thulium. The imprinted nanocrystals form into colored stripes; the researchers report producing nine colors so far, but they say many more colors are possible. The microscale particles can then be configured with combinations of these colored stripes to represent a unique identifier, in much the same way a bar code works. With combinations of six colors, up to 1 million unique identifiers are possible. Adding more microscale particles expands the potential number of identifiers exponentially. In the Nature Materials paper, the researchers demonstrated these identifying particles in materials simulating pharmaceutical packaging, objects like glass made at high temperatures, and biocompatible materials. The tests embedded the particles into two different types of polymer materials, one that attracts water and one that repels water. The colors generated are identical in both types of polymer. The team also reports tests of the particles show they can withstand extreme temperatures, exposure to the sun, and heavy wear. Inexpensive technologies widely available today can read the encoded particles. When illuminated by near-infrared light, like that put out by a laser pointer say the researchers, the particles shine brightly. The illuminated particles can then be read by a smartphone camera with 20-times magnification. Doyle and colleagues are working on a smartphone app to read, process, and interpret the encoded particles. The authors in March 2013 filed two provisional U.S. patents for this technology.